Join the #SundaySupper group as we cook up some great Retro Recipes. Isabel, from Family Foodie, founder of #SundaySupper is our gracious host this week. Let’s take a walk down memory lane and recall some of our favorite dishes growing up! Join us Around the Family Table tonight at 7pm Eastern Time and share your favorite Retro Food Memory with us! Chop up the broccoli into small pieces, removing the stems off of the large pieces. Place in a bowl with water and microwave for 5 minutes. Drain. 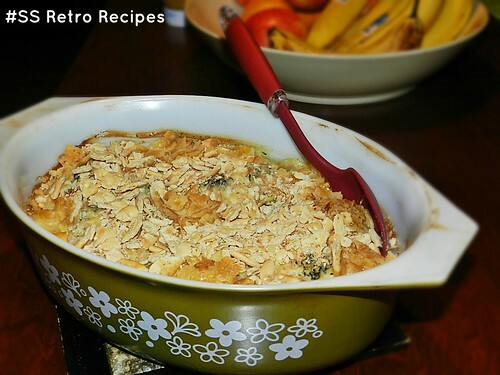 In a casserole dish (1-1 1/2 quart dish) mix the cream of broccoli, cheddar cheese and sour cream together. Add the steamed broccoli and mix well to combine. Beat the eggs in a separate bowl and pour it into the mixture as evenly as possible. Preheat oven to 350 F. Crush the crackers in a sealed zip-lock bag. Use a rolling pin or soup can crushing them up as much as possible. Pour them on top of the broccoli mixture and place the 4 tbsp of butter on top scattering pieces throughout the top. Cook covered for 40 min. Uncover and cook let cook for 5-10 more to brown the top. 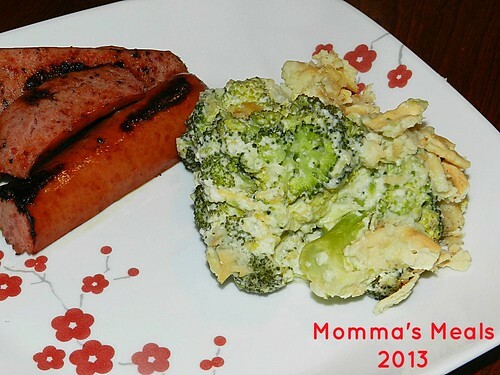 I served mine with Kielbasa the night I made this because it’s one of my daughters favorites, I even got her to eat some of this casserole, my grandmother would be so proud!!! I used sour cream to make it a little more healthier and I have to say, I didn’t even notice the difference!!!! 🙂 I wish my grandmother could have had some! Now onto what the rest of the group has made this week, lets go back in time and share everyone’s Retro Recipes! This is perfect! Great way to get your broccoli in!! Yum! I love broccoli casserole! This one looks amazing! Two scramble eggs, I have never seen that before. It would be great!! Nice casserole! Mmmmm…this looks awesome – and I love the real-thing-retro dish! I think I’ve only ever had this once, but your version looks better than what I remember! I would eat this up too…so good! When the ones we love pass on, it’s so special to remember them via their cherished recipes. We make my Great Gramma’s yeast rolls and baked white beans every winter! What a great casserole! We didn’t eat much broccoli growing up, but I would love it now! This looks like a very unique recipe. But when do you add the egg? Hi Laura! Yikes LOL, my mother took back the recipe before I had written my post. I just edited it and updated it! Thanks for letting me know! Such a sweet way of remembering your grandmother. 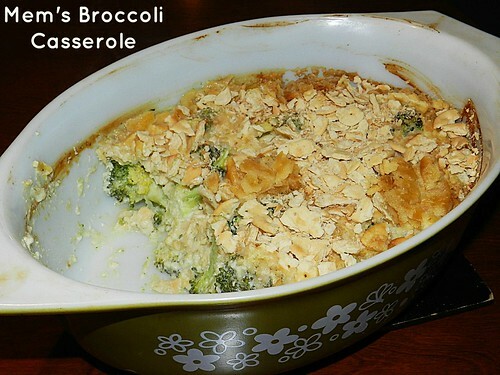 This is an amazing broccoli dish, so yummy! How great you were able to get your grandmother’s dish. I know you will think about her every time you see it and use it. What a treasure! Such a perfect retro dish!!! Interesting recipe! For the eggs, do you mean that they should be scrambled eggs (cooked) or are they beaten raw eggs that go into the casserole? I updated the recipe the other day Donna, sorry about that, I left out what to do with the good ol’ eggs LOL….just beat them together and pour it into the casserole before baking it. What a yummy retro casserole! And how wonderful that you have both your grandmother’s recipe AND dish for it!!! I love broccoli and think this looks wonderful! My 9 year old would love this dish! I may need to surprise him one night.